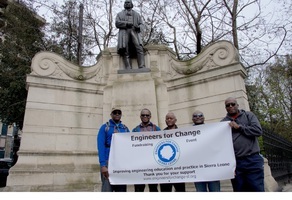 The fun and health challenge organised by Engineers for Change (Sierra Leone) held on 10th April 2016 was successful on many levels. 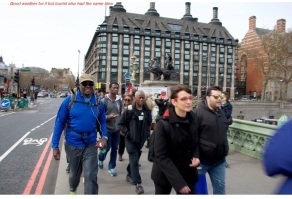 The walkers were fortunate to have had a bright, dry and cool day which made the 25km walk enjoyable as they marvelled at the majestic iconic bridges crossing the Thames and the architectural landmarks along the route. They set-off from Bishop’s Park in Fulham, crossing Putney Bridge and every bridge that allows for pedestrians thereafter until they got to Tower Bridge. On route, by Embankment station, they spotted a statue of the renowned Victorian Engineer, Isambard Kingdom Brunel. The engineers in the group were delighted to seize the opportunity for a photo in front of the statue of this great engineer. The trustees of EfCSL have been greatly encouraged by the outcome of their fundraising campaign as they achieved their fundraising target of £5,000. The funds raised are for the purchase of engineering laboratory equipment to support university education in Sierra Leone. Thank you so much for supporting our fundraising campaign by your generous donations! This is likely to be an annual event and we look forward to walking with you next year!